Mountain View’s alleyways are moving closer to a makeover. In 2014, a proposal to study alley conditions and resurface select routes received $250,000 in state capital funding. 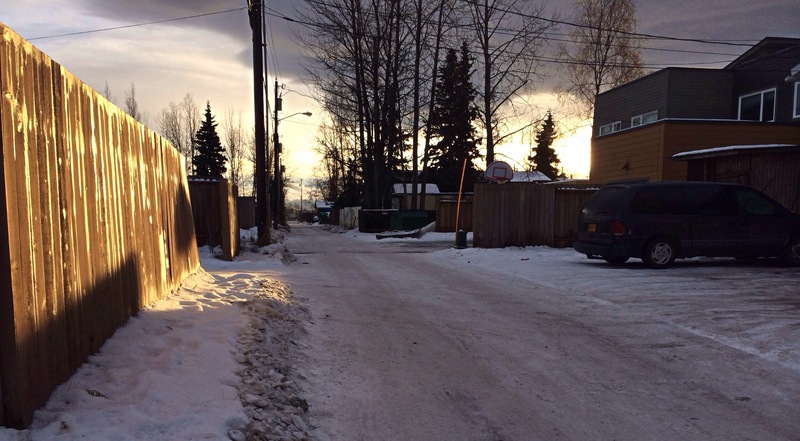 Now, Anchorage’s Public Works Department is going through the process of prioritizing neighborhood alleyways based on existing problems and future utility work in the area. The current funding should be enough to resurface 5-10 alleys, according to the municipal Project Management & Engineering Division. Russ Oswald, a municipal project engineer, said “it does appear likely” that crews will complete some of the paving work this coming construction season. Paving every alleyway in Mountain View could cost another $750,000, a 2014 project report published by the Office of Management and Budget states. Daniel George, president of the Mountain View Community Council, suggested the city consider alleys with the highest levels of traffic, including those that run behind multiple multifamily dwellings and those that provide the main form of access to driveways and parking spaces. Keep the alleys muddy. Kids enjoy them more! The Falafel lady looks like she can make the good stuff. I’ll be stopping by there ASAP!